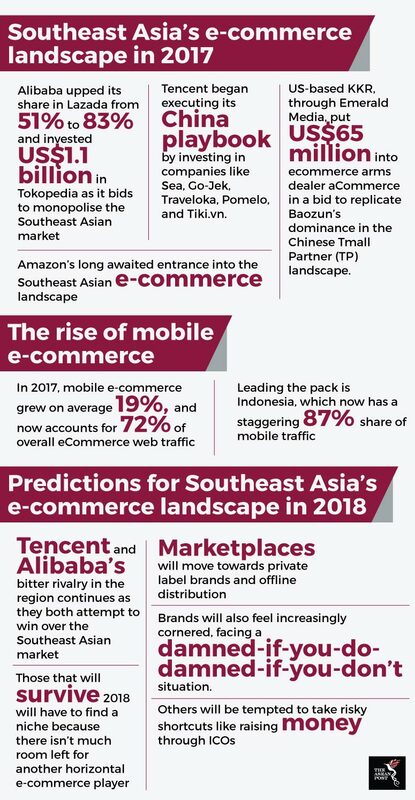 2017 was an exciting year for the e-commerce landscape in Southeast Asia. Amazon became the latest big new entrant into the e-commerce scene, mobile payments and e-wallet services were booming thanks to new fintech companies and regional gaming, new game startup, Sea, raised US$884 million after being listed on the New York Stock Exchange and the list goes on and on. Perhaps the most contentious development which will forever shape the e-commerce landscape in Southeast Asian is the continued tussle between e-commerce giants, Tencent and Alibaba, as they attempt to speed up their expansion outside mainland China. Why are these two big players scrambling for a piece of the Southeast Asian action? One reason, is the immense market potential that this region holds. The ASEAN region is home to almost 640 million citizens. Its three largest markets are Indonesia (261.1 million), the Philippines (103.3 million) and Vietnam (92.7 million) which make up 70 percent of the ASEAN citizenry. Indonesia has recently emerged as the hotbed of startup activity, having had five unicorns already – all of which have the immense Indonesian market to thank for their success. With a growing internet penetration rate, it is no surprise then, that there are approximately 7,000 startups in the region offering a myriad of technological services including e-commerce. According to management consulting firm, Bain and Company, Indonesians, for example, use an average of 5.1 e-commerce platforms per year. Nevertheless, there are some players that emerge better off than others. Lazada, is a fine example of one such e-commerce platform. It has become the leading platform in four of the six markets it is currently operating in. Besides that, increasing smartphone usage has also been a key driver for e-commerce as the region’s primary e-commerce web traffic comes from that nifty handheld device. According to a report by iPrice Group, mobile e-commerce has grown 19 percent on average and in 2017 accounted for 72 percent of overall e-commerce traffic. Indonesia ranks highest among ASEAN states with an 87 percent share of mobile traffic. In one corner of the ring is charismatic business magnate and entrepreneurship icon, Jack Ma – co-founder and executive chairman of the Alibaba Group and on the other, is low profile, camera shy, but incredibly influential internet and technology entrepreneur, Pony Ma – founder of the Tencent Group. These two giants have been engaged in a free for all in Southeast Asia – each eating up local e-commerce startups and increasing their shares in existing ones. Alibaba has tried to cement its grip on the e-commerce market by increasing its share in Lazada from 51 percent to 83 percent as well making a US$1.1 billion investment in leading Indonesian e-commerce player and rival to Lazada, Tokopedia. What could possibly transpire is a mirroring of Alibaba’s model of an online B2B (business to business) store, Tmall and a C2C (customer to customer) store, Taobao – with Lazada being the former and Tokopedia the latter. On the other hand, Tencent has employed a similar strategy used against Alibaba in China by investing in gaming, mobile and payments. It has become the largest shareholder of Sea and is keen on raising Indonesian app Go-Jek’s profile from a primarily e-hailing app to a “super app” like WeChat. As majority shareholder of e-retailer JD.com, Tencent has used the company to make inroads into Southeast Asia. In 2016, it reached a joint venture agreement totalling US$500 million with Thailand’s Central Group to work on e-commerce and financial technology. JD.com has also been integral in gobbling up other e-commerce players including Indonesian unicorn, Traveloka, Thai online fashion site, Pomelo Fashion and Tiki.vn, dubbed the Amazon of Vietnam. What the future holds is more of the same – perhaps with much more aggression. Given Amazon’s foray into the region’s e-commerce scene, Alibaba and Tencent will be more inspired to up their game and solidify their presence in Southeast Asia. As the acquisition war heats up, we may expect a similar mirroring of trends between the two’s actions as seen in China, but here in the region. Alibaba has shifted its focus to more offline shopping spaces and Tencent has engineered a push for research and development in the field of artificial intelligence. How will this play out in the coming years will only make the technological landscape of the region all the more interesting.